Travelling has always been a major part of my life and I am very thankful to my mother for that! I love travelling to remote areas because these are the places where you really find your inner peace and also explore breathtaking views! 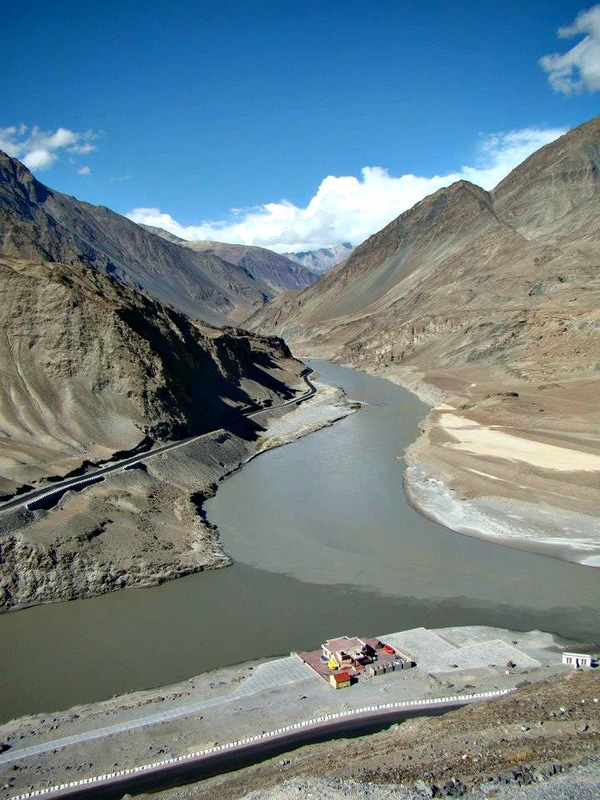 We were delighted to get such positive responses on the last travel story, Road to Ladakh. In this post I will take you through all the places I visited when I was there and I hope it makes you pack your bags and head to my favorite place too! On our first day in Leh we did some local site seeing. Our first stop was the Zhanskar -Indus Sangam. This confluence is a lovely sight. It is amazing to see how the water from two rivers meet but do not mix and you can clearly see the color difference which separates them. We then visited the Alchi Choskor. The term Choskor is applied to only principal monasteries. Alchi is one of the wonders of the Buddhist world. The terraced buildings of the monastery are on a hill overlooking an enchanted landscape. 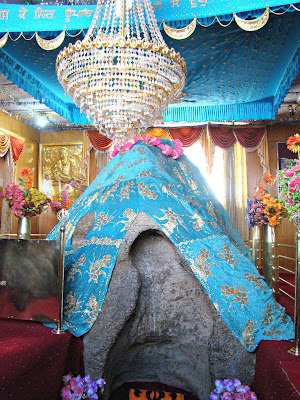 Our next stop was the Gurudwara Pathar Sahib. 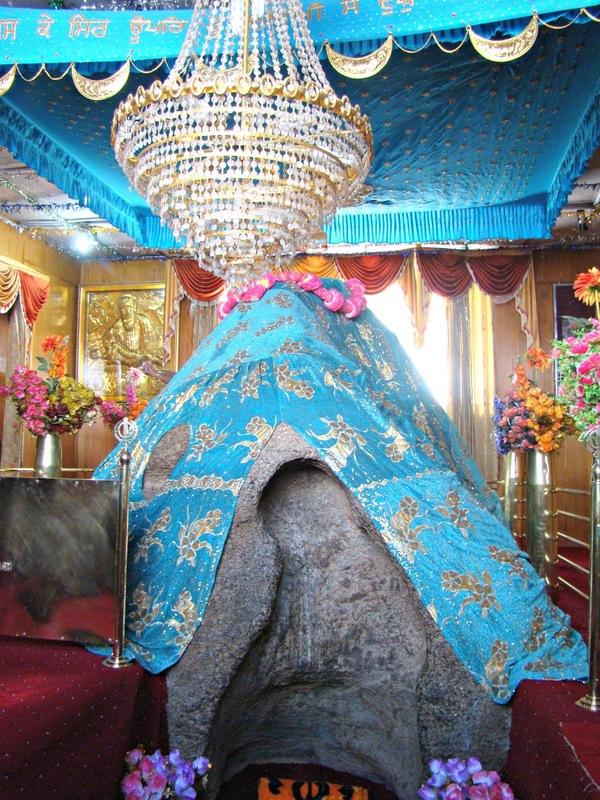 This beautiful gurudwara that lies 12000 feet above sea level was constructed in the memory of Guru Nanak Dev, the founder of the Sikh faith. We then visited one of the most fascinating places in Leh, The Magnetic Hill. This hill claims to defy gravity and when the vehicle is left in the mentioned slots it seems to go uphill on its own. I did come back and read a bit about this mysterious hill and found out that the slope and the surrounding landscape of the hill creates an optical illusion that the downhill road is an uphill road. Nevertheless, testing gravity here was a lot of fun and the childlike excitement you see on everyone's face is wonderful! At 11200 feet, our next stop was the gorgeous Thikse Monastery. I know all the monasteries look almost the same in pictures but trust me they were all very different from one and another. I think we spent the maximum time here in Thikse when compared to all the other monasteries. One of the most interesting things I want to mention related to this trip is the quirky road sign boards all along. 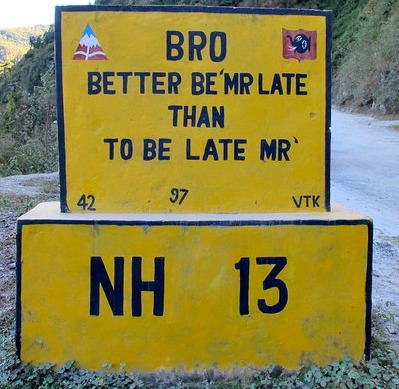 These boards have been designed by Border Road Organization (BRO) and are a witty way to remind us to ride safe! Here are some of them. 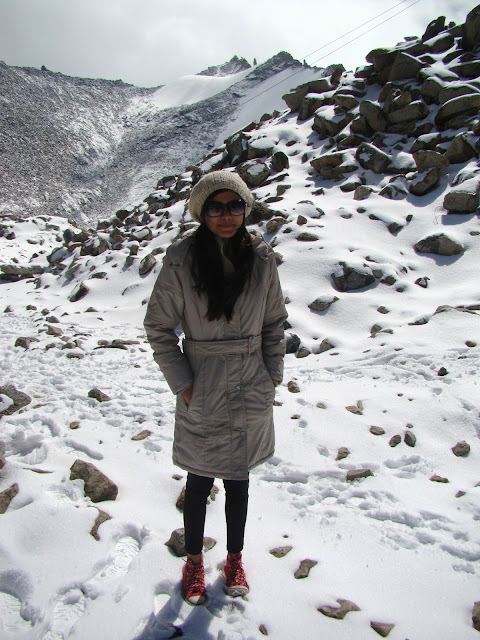 The next day we made our way to Khardung La. 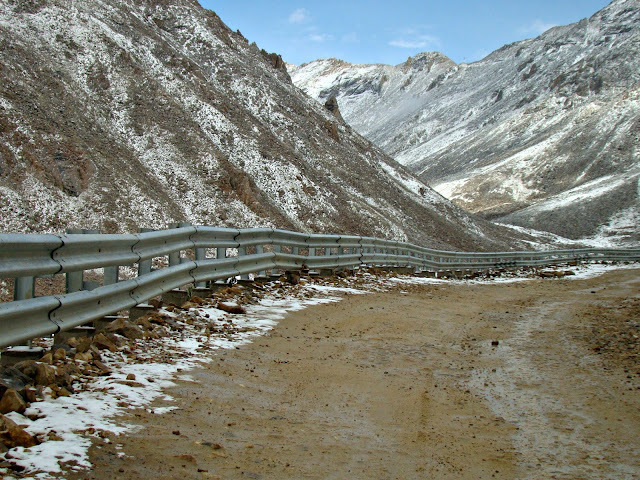 This pass is the gateway to the ravishing Nubra Valley. 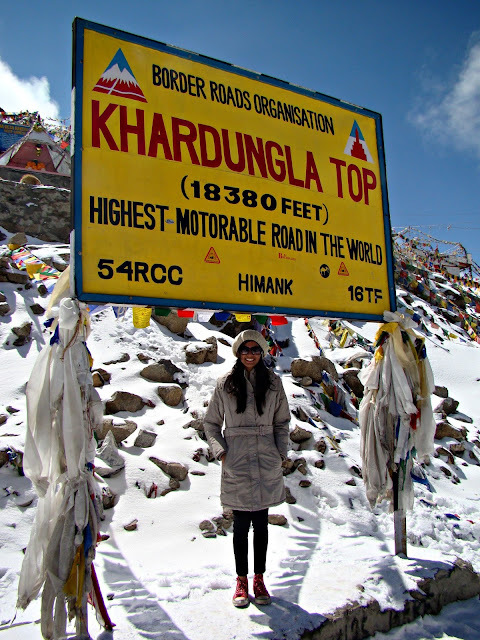 At 18380 feet, Khardung La is the world's highest motorable road. We were lucky enough to witness snowfall here. 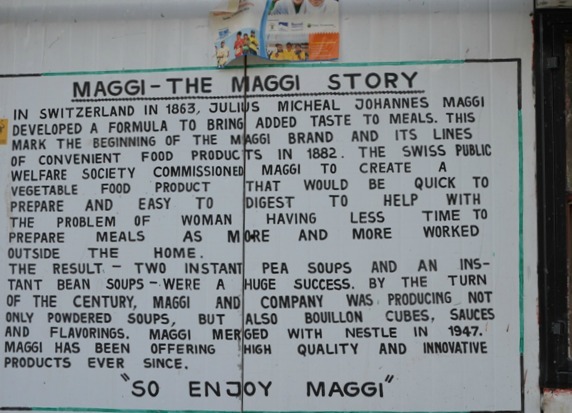 Maggi and tea are famously served at the only shop at Khardung La. Having Maggi at this temperature is the best thing that can happen to anyone! You all must have heard about the Siachen Glacier. 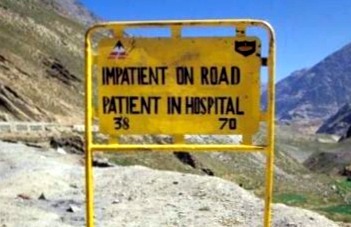 Siachen too can be reached via Khardung La. 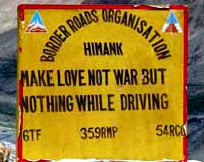 This board about Siachen at Khardung La is worth a read. After crossing Khardung La we then reached Nubra Valley. 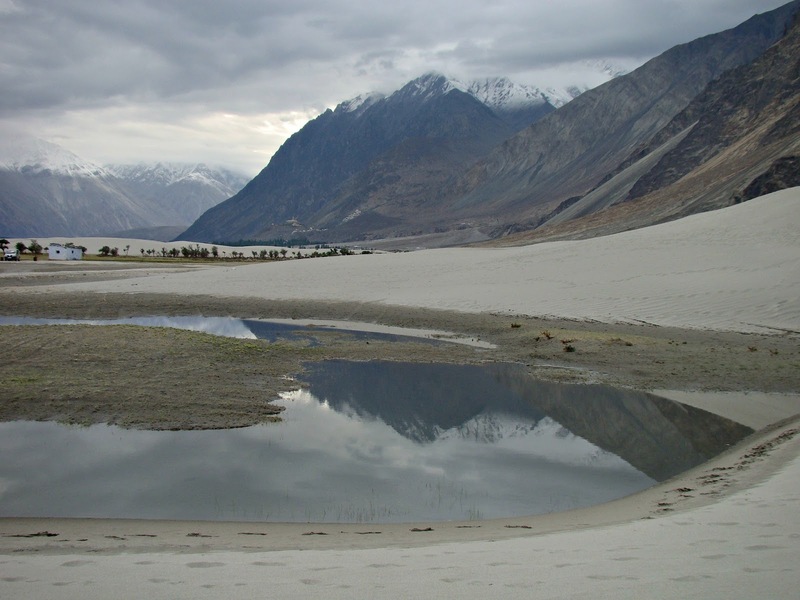 Nubra is a high altitude cold desert. 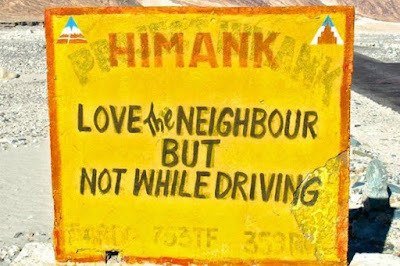 Our first stop in the Nubra Valley was Panamik. This hot spring village is a restricted area so do get permission before planning a trip here. Panamik attracts people from all over the world to take a dip in the hot sulphur spring. They have beautiful bathrooms with showers and a small pool. A dip in this spring water claims to relieve you from certain skin problems and also body pain. It sure was refreshing! I don't have a picture of the spring as we had conveniently left the camera behind! But there wasn't much to see there. It was just the dip in the hot spring and it is definitely worth a visit. Everyone just wanted to sleep after the dip in Panamik so we then headed to Hunder, our home for the next two days. We stayed at a beautiful guest house in Hunder. The desert was very close from the place we were living. 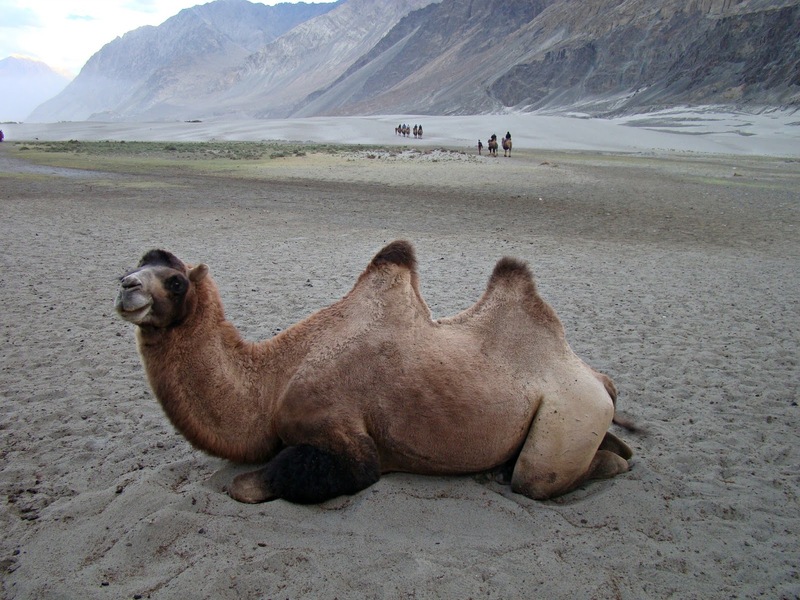 In the desert we saw the Bactrian camel aka the double hump camel. You find these species only here in India. The next day we visited another restricted area, Turtuk village. 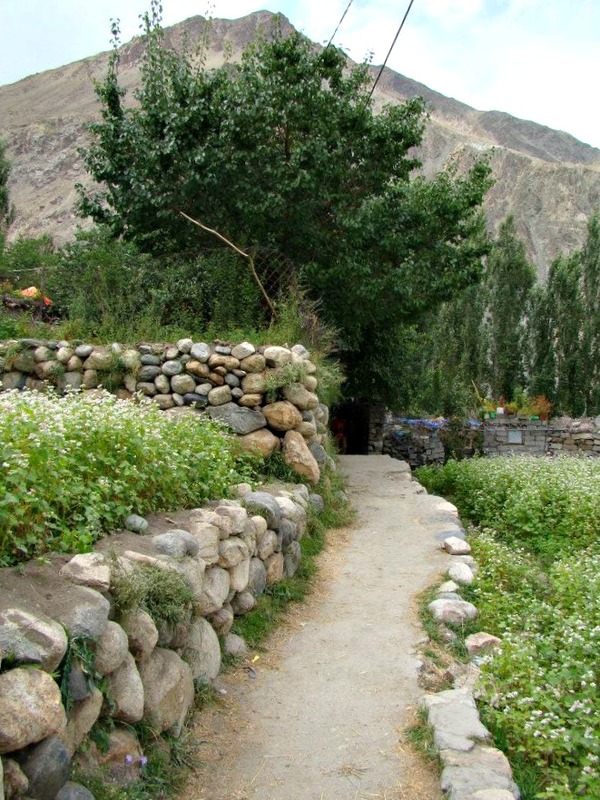 Turtuk is the last Indian village before the Pakistan border. 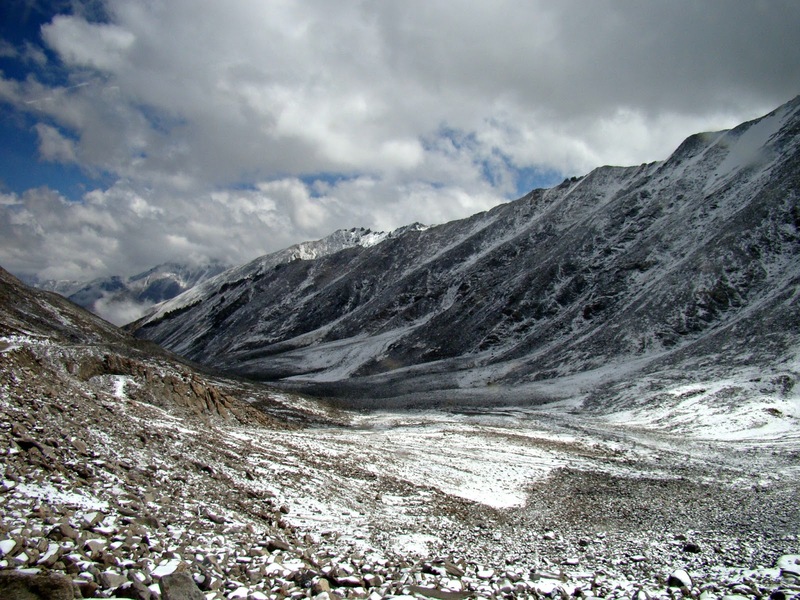 Turtuk offers beautiful views of the Shyok Valley. Also you get some amazing apricots here. The village is beautifully maintained. It is an orthodox village and most of the people stay at home when tourists are visiting. Another monastery that we visited which is worth mentioning in this post is Deskit Monastery. 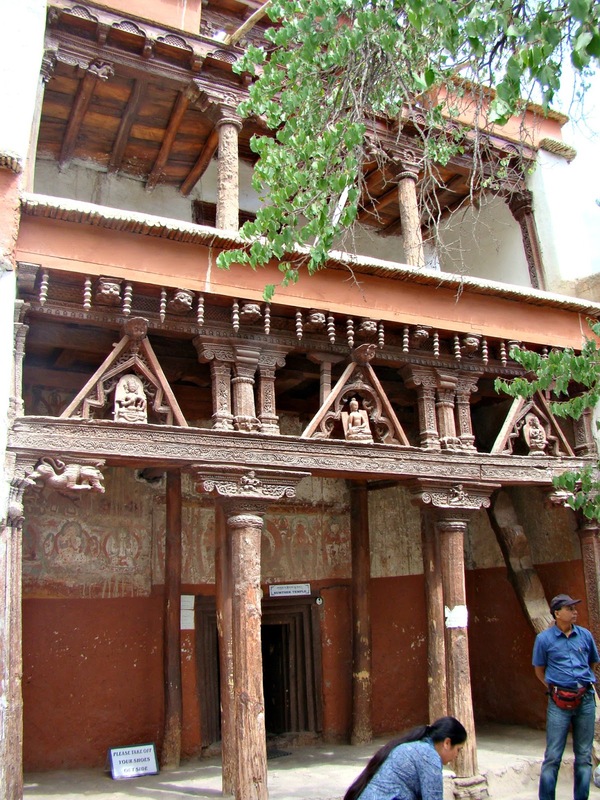 This 700 year old monastery is dedicated to Maha Kaal. 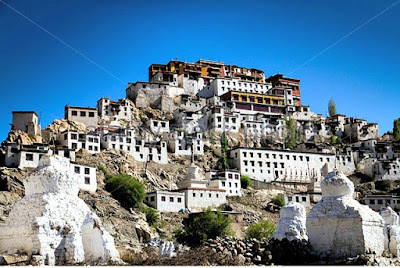 This beautiful monastery is located on two hills. 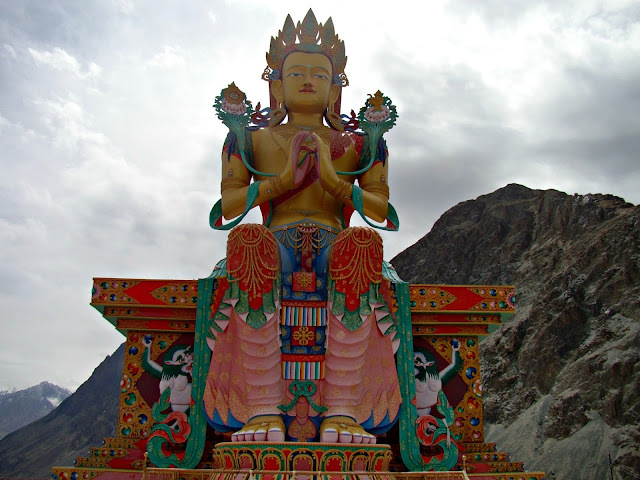 It is the largest and oldest Buddhist monastery in the Nubra region. 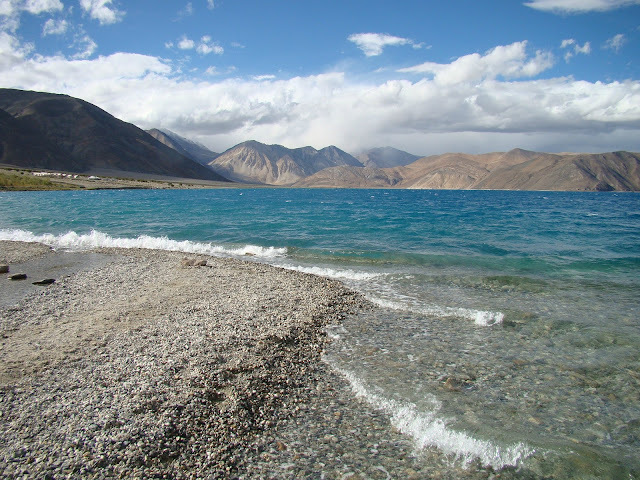 Our Nubra Valley trip ended and then we made our way to the final point, Pangong Lake. This is another restricted area. 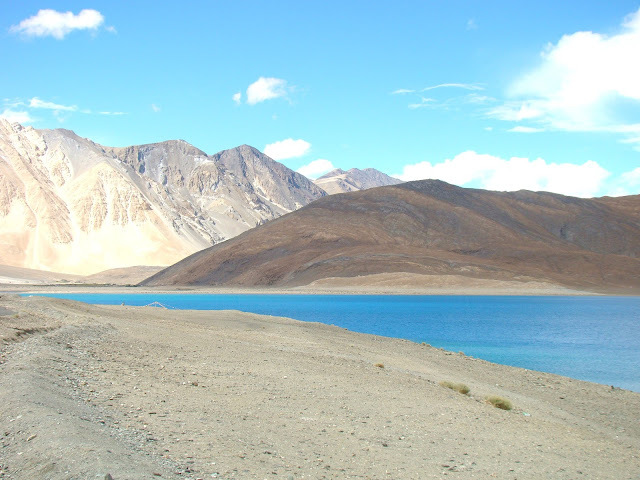 We reached Pangong via Chang La. 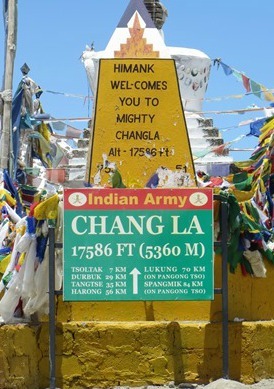 Chang La is the world's third highest pass. By the time we reached Pangong Lake we were quite tired as the trip was indeed very long. We were acclimatized to the temperature by then but the oxygen content in these areas was very low which was exhausting. 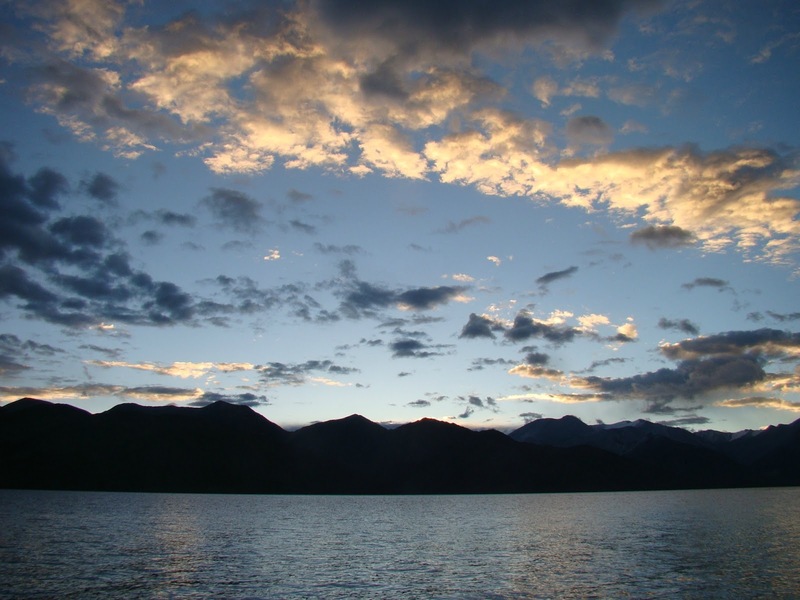 I had not read or heard about Pangong lake before and I am so glad I hadn't! When I reached there I was completely surprised and mesmerized by its beauty. Pangong Tso is a visual treat! This high altitude lake at 4420m is 150km long and about 5 km wide, but about 2/3rd of this length lies under Chinese territory. 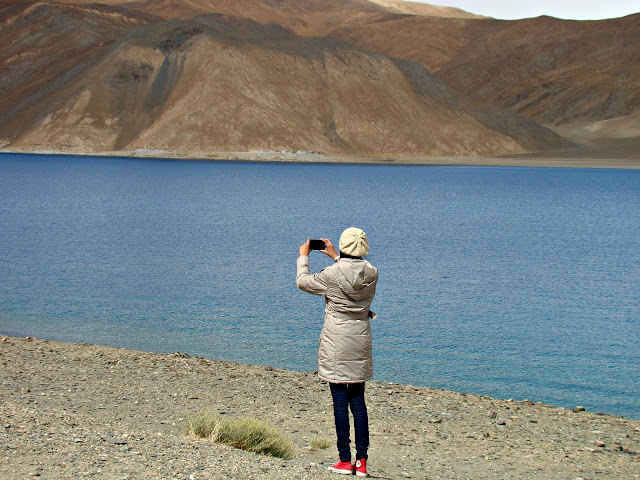 Pangong Tso is a restricted area and you will require special permission to visit. This is Asia's highest and largest saltwater lake. The sheer Turkish-blue color of the water reflecting the surrounding hills and the blue sky is indeed enthralling. The water was really really cold and the temperature here was also very low due to the height. We spent a night in front of this gorgeous lake to catch a glimpse of it early morning. The night at Pangong Tso was one which I will never forget! Nobody lives at the lake so its just a few travelers who spend the night here together. There are just a couple of tents available so a maximum of twenty people are there by the lake in the night! Also there is no lighthouse or any electricity here so it gets pitch dark by the evening. The night I spent here was quite scary as when I stepped out of the tent I saw nothing but water and also the temperature was very low. The oxygen level was also very low which made it difficult to breathe comfortably. I spent the entire night waiting for dawn and listening to music on my phone (Thankfully I had charged it before!). Although I had a difficult night I completely forgot about it when I saw the sunrise at this magnificent lake! I cannot describe the emotions I felt when I saw it. The pictures just portray 1% of the beauty this lake possesses. You have to go there and witness its charm yourself! 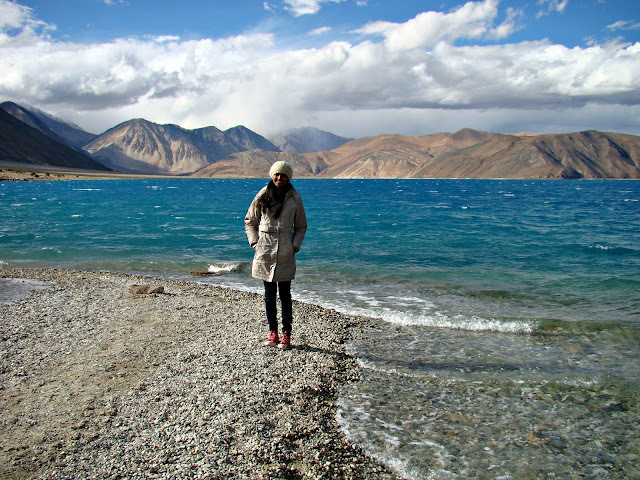 Pangong Tso was definitely my favorite part of the entire Ladakh trip! We then drove back to Leh via Chang La and spent the night in this calm city. The next morning we big goodbye to Ladakh and took a flight back home. A lot of people take the road to Sri Nagar on the way back but we knew we would be too tired after this entire trip to be on road for another few days! The flight journey was also one of it's kind. Here are some of the aerial pictures of the Himalayan range! We had a three hour transit at the Delhi airport and those three hours were really awkward as suddenly I was surrounded by people. I had mixed feelings regarding going back home. I was tired and I did miss home but I didn't want the journey in Ladakh to come to an end. Like I mentioned in the previous post, this trip completely changed me. Travelling changes your perception on a lot of things and I am so glad I experienced the Himalayan beauty. 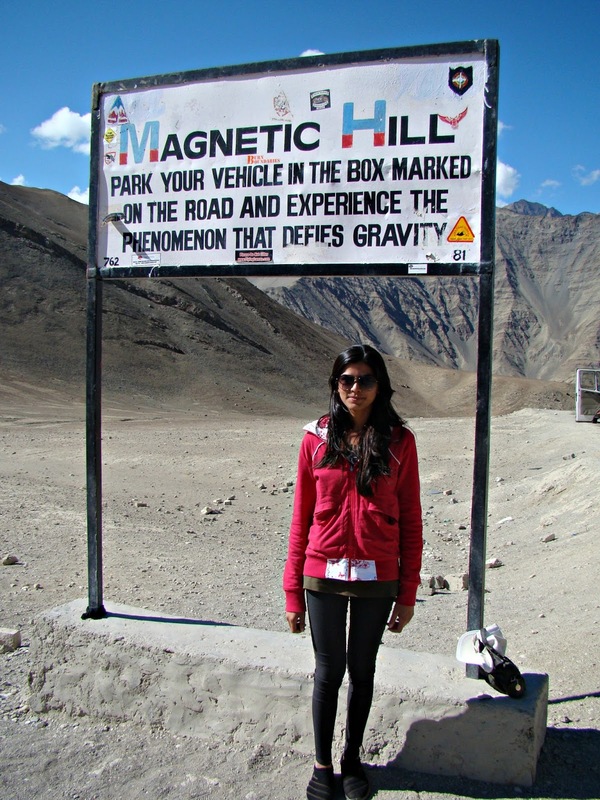 If I get another chance to go back to Ladakh I would go without having any second thoughts! The journey wasn't easy, it wasn't like a usual luxury trip. This trip was filled with hardships but I think that is what makes the entire journey all the more special! I haven't explored Ladakh fully and I hope to go back there soon and visit all the places I missed out on! If you guys enjoyed this post and want us to share more travel stories then do let us know! We would love to hear from you. Your Blog is Great Thank you for posting it, All the pictures are great thanks for Posting Pictures, your Pictures are amazing, I will post my Europe tour Blog Soon.